Premier Luxury Suites has short term and corporate rentals Chicago. We are proud to work with business travelers coming in to the Chicagoland area that require a place to stay. Sometimes we get business customers that stay for a week or customers that have to stay longer near or within the city to take care of necessary business for his or her company. This user-friendly website has both city properties and suburban properties listed. Each property comes fully furnished. All downtown Chicago locations receive weekly maid service. Our short term and corporate rentals Chicago come with high-speed internet, cable TV, a fully-equipped kitchen, a DVD player and iPod Docking Station, telephone and more. You can view our furnishings associated with our rental properties on this website. Please speak to us if you have any questions about a specific property that you are interested in. You can also inquire about any special offers that Premier Luxury Suites may have going on. There are times when you can definitely save some additional money when it comes to upscale luxury stays, long term or short term. Our professionals will be more than happy to tell you about any current offers that we have going on. Photos of some of our rooms have been listed on this user-friendly website. You can also inquire about our custom furniture packages that we have available. Short term and corporate rentals Chicago from Premier Luxury Suites will give you the luxury, comfort and appealing surroundings that you desire. You can expect a quiet and comfortable atmosphere in our rooms. Our company not only works with business travelers, but we also do business with recreational travelers, vacationers and people that want to relocate to Chicago. Premier Luxury Suites gives you the opportunity to choose a style to your room with our short term and corporate rentals Chicago. Our different property locations come with their own theme and scenic settings. We have mapped out specific locations on this website, so that you will know where your property of choice is situated within the Chicagoland region. All locations provide you with convenient access to the Chicago Loop, Michigan Avenue, great shopping venues and lots of attractions. Taxis and public transportation options are also available to get to where you need to go. Bus and train connections can be found by calling the number we have listed on this website. 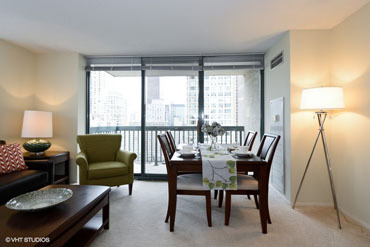 Contact Premier Luxury Suites today to find out more about our short term and corporate rentals Chicago.